Do You Really Want To Beat The Market? All investors want their portfolios to do well, and of course we all would love to“beat the market.” But at what cost? How much risk are you willing to take? Generally, when we say “the market,” we are referring to the S&P 500 index (S&P 500). This is the most commonly followed stock market index, which largely represents U.S. large-capitalization stocks such as Apple, General Electric, Johnson & Johnson, to name a few. (Note: Shares of Apple, Exxon Mobil and Google are currently on BWFA’s “Buy/Hold” list, representing securities held in client portfolios.) Some view the S&P 500 as the primary equity benchmark to measure investment performance. It is certainly the most commonly used measure for portfolio performance. 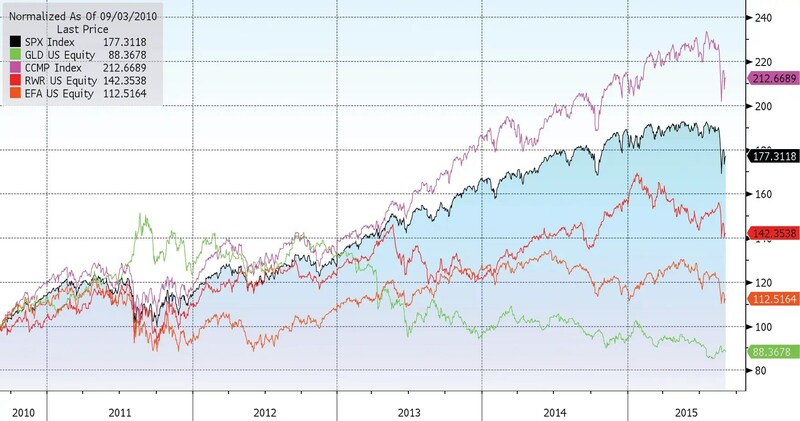 But, is the S&P 500 truly a reasonable benchmark for a diversified portfolio? The average investor might hold many different types of common stocks in her portfolio, along with bonds, foreign securities, U.S. Treasuries and maybe even some commodities. If an investment portfolio is diversified in this manner, then an index that holds only large U.S. companies might not represent the best comparison. Still, investors often question why their mutual funds or managed accounts did not beat the S&P 500. Were they supposed to? Was that a goal? In order to closely match the performance of the S&P 500, an investor would have to place 100% of her portfolio in in an ETF of that one particular index. This means that 100%of her entire retirement savings would be dependent upon the performance of one index—an index that consists solely of large-cap stocks. Ask yourself, do you want all of your money dependent on the performance of one index or one asset class? Even if an investor were to place her entire savings into a single index, doing so would only give her the potential to match the S&P 500. In order to actually beat the index, she would have to insert other securities that are not part of that benchmark to hopefully provide the portfolio the boost it needs to outperform the index. An investor could also try to speculate which stock will perform the best and overweight that position. Another tactic could be to anticipate a market correction and trade ahead of it by increasing the allocation to cash, or even going all to cash. Sound risky? It is! Is this an effective strategy for your retirement assets? Most would agree that it is not. The Nasdaq Composite Index (Nasdaq), a group of stocks that is heavily weighted toward volatile industries such as biotechnology and information technology, is currently outperforming the S&P 500 in 2015 (as of 8/24/2015). It is probably unlikely that anyone has asked his fund manager or financial advisor, “Why haven’t you kept up with the Nasdaq this year?” The truth is, there are many different indexes, and their year-to-year performance is unpredictable. 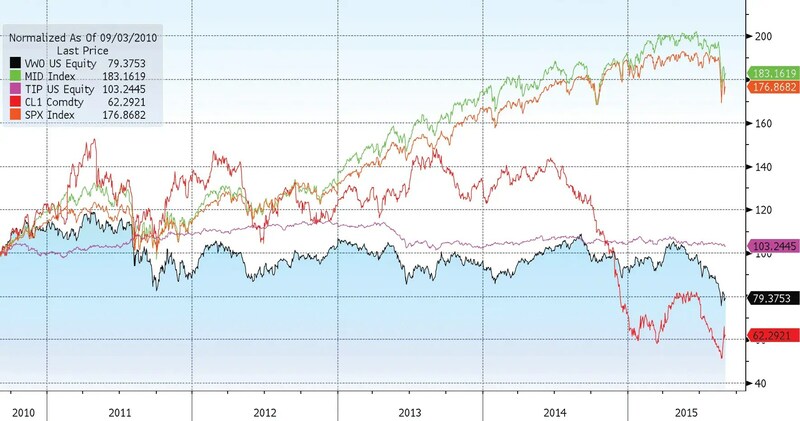 Below are two separate charts illustrating performance for an array of market-based exchange-traded funds (ETFs), commodities and indexes over the last five years. As you can see, the returns of these different indexes vary depending upon which investment was held and when the investment was purchased. These charts illustrate that the investment landscape can change rapidly and without warning. For instance, the oil market (CL1 Comdty) appeared as if it would outperform both the S&P 500 and the Nasdaq over the five-year span; however, starting in mid-2014, it declined heavily on concerns about rising supply and a slowing Chinese economy. Likewise, investments representing emerging market stocks (VWO) appeared to be heading for a great year in 2015, only to reverse course and fall into bear territory on news of slower global economic growth. Next year, we could see the opposite, with emerging markets and oil leading the charge. When analyzing the performance over the last 10 years of some of the other major market indexes, we see that the S&P 500 has not been the best performer. There have been many asset classes and indexes that have outpaced the S&P 500. The Nasdaq, for example, has clearly outperformed the S&P 500 (SPX) by more than 30%. The same can be said for oil, as it, too, was outpacing the S&P 500 for much of this period until it started to plunge around the middle of 2014. Does this mean investors are supposed to rush from sector to sector simply to keep up with the hottest asset class? The answer to that question is an emphatic NO! No one knows how these indexes will perform from one year to the next. So again we ask, is it reasonable to assess performance based on the returns of just the S&P 500? Investors who intend to maintain a welldiversified portfolio need to hold securities representing a variety of different indexes or asset classes. They should aim to gain exposure to several areas of the market and invest across multiple asset classes.